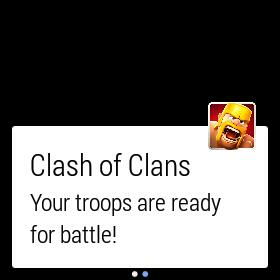 An Android Wear notification from "Clash of Clans". Google has posted a number of notifications to show what users will be able to see on their Android Wear smartwatches, including integration with Nest's smoke detector. Wear is an extension of Android, and to make the OS a better fit for the small-screen smartwatch, the user interface relies on voice control, Google Now and notifications to present relevant information to the user. On Wednesday, Google's developer advocate Timothy Jordan posted images of a number of notifications. The first show how a Wear-based smartwatch can be integrated with a Nest smoke alarm, warning "Emergency: There is smoke - Office" and then following up with a new notification saying "Smoke clearing - Office." Google announced in January it was acquiring Nest for US$3.2 billion. Jordan also posted notifications from the "Clash of Clans" game, the Google calendar and the Pocket Casts podcast player. "One of the coolest parts of Android Wear is how it extends the Android platform to a new generation of devices out of the box, without any need to update your app. If you have a notification-enabled app, those notifications will generally just work on your new wearable," Jordan said. For developers that want to take a closer look at what the platform can do, Google is offering the Android Wear Developer Preview. It includes tools and APIs (application programming interfaces) for optimizing app notifications. The first two Android Wear-based smartwatches are expected to be the G Watch from LG Electronics and Motorola's Moto 360, which will start shipping in the next couple of months.